Clarification: Today is the last day for SBS 2003 Open Value Licensing Purchases! It seems, that clarification was in order since requesting the new SKUs for SBS 2008 it has been pointed out to us that as of tomorrow, the current SKUs going forward from October 1, 2008 will be for SBS 2008 products only! There was a little bit of a misunderstanding on our part as far as the price increase also being related to the fact that SBS 2003 will no longer be available for purchase on an Open Value Licensing Agreement as of tomorrow. That means that all of the juicy Software Assurance benefits we get with an SBS 2003 R2 Premium, and Standard too, will end today! A downgrade to the SBS 2003 edition purchased will be a part of the Licensing Agreement which means that we will be able to install and configure an SBS 2003 R2 Standard or Premium setup. This does not mean that we will be able to run any combination of the SBS 2003 and SBS 2008 licensed product. We will need to run either one or the other environment only. In this case, it pays to be clear in our communications and the questions we needed to ask about the price increase. It did not dawn on us that the price increase would also mean the end of SBS 2003 as we know it for Open Value Licensing. A quick search via a few search engines turns up little in the way of an announcement that SBS 2003 would no longer be available for purchase via Open Licensing. Anyone have a link to a page that is clear about this? Please post it in a comment. And, none of the Microsoft Partner materials that we went through has any indication of the end of SBS 2003 availability on Open Licensing either. We just received our Open Value Licensing media for SBS 2003 R2 Premium. Notice that a TechNet Direct subscription is included. This means access to all of Microsoft's software products without a time-bomb for lab use. We take full advantage of our TechNet Plus subscriptions! With the advent of call back support for SBS products (previous blog post), and no hint from Microsoft that we can purchase a support contract focused at the SMB I.T. Partners, we have a fall back for us and for our clients: 24x7 Problem Resolution Support. With each Open Value License we implement at our client's sites, and now our own, we can at least turn to the folks in Redmond to get support if we do indeed hit a brick wall with the SBS setup. We are fortunate in that we have only hit the wall 3 or 4 times in the history of our company. And, in all of those cases we were also fortunate to work with someone who actually knew the software product that had choked on us. Something to keep in mind when quoting on new or soon to be refreshed SBS installations. Also note, today is the last day before a price increase for all SBS Open Value Licensing SKUs. An early bird special of 50% off the price for either the one day or two day events is on until October 15, 2008. The two tracks that I will be focused on are the Virtualization and the Infrastructure ones. The decision for which session is going to be tough too, especially with the last one being a tie between SoftGrid application virtualization (MPECS Inc. and our clients are on Vista SA which includes SoftGrid) and the PowerShell and WMI session for the Infrastructure track. For now, PowerShell and WMI will win out, with the ultimate decision being made when I can find out a bit more about the meat and potatos in each session. Planning Successful Physical to Virtual Server Migrations with the Microsoft Assessment and Planning Toolkit. Streamlining Administration of Your Active Directory Deployments Using Group Policy Preferences, Templates, and Scripting. Managing Your Virtual Infrastructure Using System Center Virtual Machine Manager 2008. Automating the Management of Windows Servers using PowerShell and Windows Management Instrumentation (WMI). Successful Migration Techniques For Migrating To Microsoft Exchange Server 2007. Windows Deployments the Way You Want Them: Unleashing the Power of the Microsoft Deployment Toolkit with Customization. Security in a Virtual World - How to Lock Down Your Virtual Environments. Many of these sessions are directly applicable to the infrastructure solutions we have and are putting together for our clients and for our own company. There is no replacement for taking the time to sit in the presence of experts who are demonstrating the abilities and features of the various products we work with. Training, especially training that we pay for, is a very valuable part of our professional development. We work in an industry where things are constantly evolving and out right changing. Training is both an investment in our clients and our own businesses. We cannot afford to sit on our laurels with what we believe to be a good knowledgebase and experience base in our heads and hands. Doing so places our client's infrastructure and thus their livelihoods at risk. We are responsible to provide our clients with the best possible solution to fit their business needs. That infrastructure solution is not necessarily the one we think is the best, but the one that will be made up of hardware and software products that will best fit for them. If we don't know the products, then we either get to know them or get someone who does know them involved to collaborate with us in providing the solution. 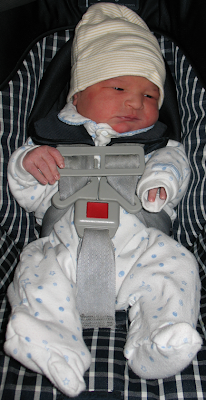 At about 04:56 on the morning of September 27, 2008, Jean-Luc Philippe Elder joined us. He weighed in at 8lbs 15ozs or about 4,055 grams. We were fortunate that Monique's mom could be with us since Tuesday which really helped to reduce the stress around not knowing when the baby would be born and what to do with Anne-Marie and Raymond when the time came. When Monique let me know it was getting close to the time Friday evening, the T-Shirt, I AM READY Launch 2007, was totally appropriate! ;) I was! The nurses sure got a kick out of it. Our children are what it's all about. There is no other way to describe it for us. 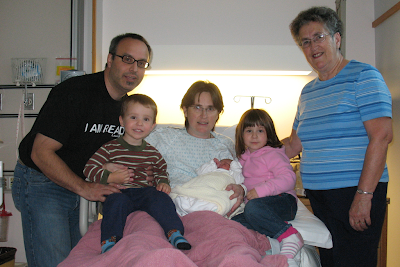 We are truly fortunate to welcome Jean-Luc weighing in at 8lbs 15ozs. UPDATE: It is Jean-Luc Philippe not Philip as I put in the original title. A client computer was absolutely refusing to accept the XP SP3 update via WSUS or manually when our client user tried it that way. So, we connected to the SBS server via Remote Web Workplace and initiated a Remote Assistance session. Service Pack 3 Setup could not backup registry key HKLM\Software\Microsoft\Internet Explorer\MAIN\FeatureControl\FEATURE_IMAGING_USE_ART to file C:\WINDOWS\$NtServicePackUninstall$\reg00161. 5:Access is denied. We did not close the error dialogue box. A look into the uninstall directory for the reg00161 file showed that it did not exist yet. So, the permissions problem was not on the file itself. After opening RegEdit and navigating to the above registry key, we were given a permissions error message. We were still able to right click on the key, click on Permissions, and add the user account with full control and apply it without complaint from the OS though. Once we did that and clicked the Retry button, the XP Service Pack 3 setup routine was able to continue. No other registry permissions errors were encountered. After a while, we were greeted by the above. The exam was very straight forward! If you have a good well rounded experience with SBS, the exam will go well. They also provide the ability to comment on the various questions ... So check it out and give Microsoft your real world thoughts on what you saw! So, off to write the SBS 2008 beta exam! I will be helping Rodney Buike present on SBS 2008 at the Edmonton Microsoft User Group meeting held at the NAIT campus tomorrow evening. Click to Attend link: Small Business Server 2008 – What’s new and what you need to know! Also, don't forget that you can check out the beta exam for SBS 2008 tomorrow. Check out Prometric's Web site for details and an exam location near you. I will hopefully be writing it in the morning. This article at Network World is a real eye opener as far as rootkits are concerned: Vista's UAC spots rootkits, tests find. The kicker? If the user cancelled the UAC prompt when the rootkit tried to install itself the install was dead in the water ... nada ... kaput ... done did be toast! To say that again: Rootkit tries to install, user clicks CANCEL when they are prompted by UAC, they will not get infected. For all of the "pain" around UAC, that to us is a "killer app" folks in more ways than one and with the pun too! The article is a good read, and provides some not so surprising results for rootkit cleaning not-so-success rates and then some. Now, to continue on training our client's users to not turn the UAC off and to be wary if they were not doing something to bring about the prompt in the first place. You see dark figures lurking in a dark cubby hole down the street seemingly looking right at you, what you going to do? Assess and make a decision pronto! That rootkit is no different ... street smarts = Internet smarts! There is no product out there that can handle these situations better than a well trained user! The whole process was a learning experience for us since nVidia is not the first stop on the high performance bus for us (pun intended). Well, when we sourced product for the motherboard, we were pretty careful to get all of the components recommended by each component manufacturer for compatibility. One of the big losses when putting together a system like this over an Intel Xeon series server is the intensive validation that the components get on the server side. So, guess what? At the time we built the workstation, Kingston was recommending KVR1333D3N8K2/2G for a system that would be configured with a total of 2 kits for 4GB. Other than one of the Western Digital Raptors outright dying, the system has been hiccuping on a random basis. There did not seem to be any indication of a source for the problem though. After the Raptor died, we made sure to flash the board's BIOS, any available firmware updates, and drivers for the motherboard, video cards, etc. Yesterday, while on the bench, the system refused to misbehave. At least that is, until we walked in this morning and found it uttering a single long beep one after the other in slow repetition. The motherboard's LCD troubleshooting block (it is embedded on the board for overclock troubleshooting) indicated a C1 which was memory initialization. We ran through the BurnInTest Pro in memory torture mode with no results. Leaving the machine idle and go into screen saver last night seemed to be the key to bringing out the gremlins. Notice a difference between what we installed and what is listed today? We are looking at an "N9" instead of an "N8". Now, we are heading out to pick up the N9 RAM to see if that actually does make a difference. Just to qualify: We have run into RAM compatibility issues like this before with listing changes over time on Kingston's site on both server and workstation configurations. So, this situation does not come as a surprise to us. And if it does ... anyone need four 1GB sticks of KVR1333D3N8K2/2G memory? We are in the process of initializing an e-mail address for our new Open Value License Agreement that will have our Small Business Server 2003 R2 Premium license plus Software Assurance and SBS User CALs on. The above message is the one we received as we were going through the e-mail initialization request. Now, given the time crunch we are under, and the fact that scheduling is a bust with baby #3 playing "hide and seek" with us ;), having anything choke on us while working on it can be a bit aggravating. After the third attempt, we were finally able to log on to the Passport site, confirm our e-mail address, and setup the particulars for the security questions and the like. As far as Open Value Licensing goes, please remember that there will be a significant price increase associated with the SBS 2003 Open Value product SKUs as of October 1, 2008. So, if you have any client quotes out there or quotes being generated that may pass the end of the month before a decision is made, keep the cost difference in mind! The reason we are securing SBS 2003 R2 Premium on an Open Value Agreement is because the value is absolutely awesome. 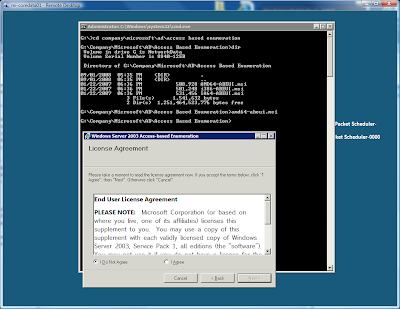 ISA 2006 + Win2K3 Std License until the release of TMG 2010. And, the other reason for us to look to SBS Open Value: Microsoft Action Pack (click the Welcome Kits and Quarterly Update Kits link) will only contain SBS 2008 Standard Edition going forward. While MAPS will have EBS 2008 Standard, we are currently not focused on that market yet ... and we need access to SBS 2008 Premium since most of our clients are or will be running Open Value Agreements for SBS 2003 R2 Premium with the need to configure SQL 2008 with their Line of Business Apps. And, having the extra server license over and above the ones we already have is a bonus. One thing we have found as we have grown as a company: We have become less and less dependent on MAPS for our actual software productivity licensing. While it is a requirement for the MSBS, our business needs and goals have developed to the point where we have needed to fine tune our licensing to the direction we are heading in. We will still utilize some of the MAPS licensed products, but for the most part we have gone independent. C:\PROGRA~1\Symantec\S32EVNT1.DLL. An installable Virtual Device Driver failed Dll initialization. Choose 'Close' to terminate the application. Since our client has Symantec Corporate 10.2 A/V managed by the server, we had uninstalled the Symantec Client Security. One of the things we do as we are prepping a system and installing their line of business applications is run them to verify that everything is good to go. This particular application is a DOS based inflation/tax/interest/ and other financial type stuff calculator written by a local Edmonton fellow. The program receives regular updates for Canadian tax updates and the like. It just works ... so why look for something else? So, after double clicking on the shortcut, that is the error that we received. To date, we have never seen this one! Error: "S32evnt1.dll. An installable Virtual Device Driver failed DLL initialization"
The first one is what fixed it for us ... almost. We need to pay particular attention to the instructions as they say to delete the data for the indicated key, not delete the key itself! Double click on the VDD key and delete the data contained therein. Note that in our case no zeros were left as the Symantec article indicated there may be. Also, if we placed the zeros in the key, the error came back when we started the DOS program. One more little thing to watch out for when threads of an old program are left by a software uninstall. The ISP that was a part of the grief we faced with a client whose IP changed (previous blog post), used to be locally owned. When they were locally owned, we spoke to real people almost immediately. In fact, over the years we were dealing with them, we got to know a number of the tier 1 and 2 support personnel very well. Their ADSL service was first in line when we were setting up a new client's office or Internet setup. They were since purchased by a company called Uniserve based out of British Columbia here in Canada somewhere close to two or more years ago now. Around a year after the purchase, the local support team was disbanded and support has since been provided solely out of B.C. Well ... the support person just picked up ... and doesn't sound too confident that they can help us. We need a second static IP for the new Intel Remote Management Module 2 out of band management product we are installing into our client's relatively new SBS box. Once we had established the reason for the call, the support person let us know which static IPs we should have ... unfortunately they were the IPs we used to have before the upgrade to ADSL 2.0 over a year ago. After we got things kinda straightened out, and there was a realization that their records were sorely out of date, we now have to wait up to two business days for another IP to be assigned to our account. There are not enough people staffing the support centre ... which could be purposeful or not. There are issues with the network causing high call volumes. The call is now finished after over 70 minutes including the hold time. We are fortunate that there are other tasks being accomplished while we are here at our client's site. But, essentially we are pretty much no further ahead than we were before we called. Fortunately, we only have two clients who are left on this particular ISP's services. The one whose IP was changed recently and this one. SBS 2008 Password Expiration Policy: 180 Days! Break out the handy dandy Windows Calculator and we come up with: 6 Months! From a Microsoft article: Strong passwords: How to create and use them. Change your passwords regularly. This can help keep criminals and other malicious users unaware. The strength of your password will help keep it good for a longer time. A password that is shorter than 8 characters should be considered only good for a week or so [highlight ours], while a password that is 14 characters or longer (and follows the other rules outlined above) can be good for several years. Given that the article states an 8 character password is good for about a week, and our Group Policy setting out of the box is set to 8 characters, there was something missed somewhere in the SBS development cycle in our opinion. A number of years back when we were preparing for SBS 2003 and Remote Web Workplace access, we spent a number of months training our client's users to use passphrases and have them rotate on a fairly frequent basis. What was that sound that we heard as we spoke about passwords turning into passphrases and requiring them to be changed? Was it something like nails down a chalk board? Or perhaps that high pitched background whiny sound that can drive people absolutely crazy? The schedule we aimed for was a 45 day rotation and in most client cases we were able to hit in and around the 50-60 day frequency. One or two clients absolutely dug in and we ended up with a 75 day rotation in their case. At the same time, we were talking about the minimum number of characters in the password, and for the most part we were able to implement 10 characters with complexity. A few were really not happy about that, but after a number of months they were able to accept the changes. One of the benefits of having the password rotate on a fairly frequent basis is the reduced number of support calls from clients with no on-site "technical" person who could reset their password for them. We also make a point of training users to change their password early in the week when they start seeing the password change reminder. There is nothing worse than having the dear in the headlights look on a Monday morning when the wrong password error comes up ... been there once. 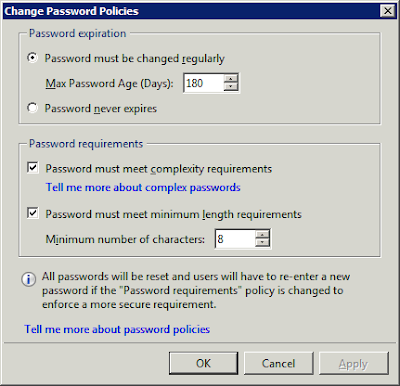 Note: If you change the password policy requirements at any time to enforce a more secure password policy, then all passwords are reset, and the users have to re-enter a new password whenever they log on to the network. The note is taken directly from the SBS 2008 Help on the subject. The online TechNet documentation does not have it from any searches done on the site. So, for any new SBS 2008 build, changing these settings to be more in line with the client's environment is mandatory before adding the users. If the policy is going to be changed on an existing SBS 2008 network, then the users need to be notified that their passwords will need to be changed as soon as the policy is implemented ... and it should be done on a Monday or Tuesday. Insane Storage Volume - 1.5TB Drives hitting the stream now! Seagate has released a new 7200.11 series Barracuda with an astounding 1.5TB (Terabytes) of storage capacity in a half-height 3.5" drive! While consumer level storage is getting this capacity, no announcement has been made for the Enterprise SATA Storage product series yet. Our suppliers do have the Barracudas SKUd up with product on order and due at the beginning of next month. We won't even tell you the cost ... they are amazingly inexpensive for a newly minted super large storage drive. As far as we can tell, their price is coming in around 27-35% less than the debut price of their 1TB siblings. Feeling the need to look into the Microsoft Desktop Optimization Pack (previous blog post) a little more but only have a couple of minutes? Then check this out: Microsoft Desktop Optimization Pack (MDOP) Demonstration By Christopher Perez Estonina, MDOP Specialist, Microsoft Asia Pacific Presentation Deck by Christopher Perez Estonina who is an MDOP specialist. Note that registration will be required. You will find 16 slides that will give you a quick and simple presentation of some of the key MDOP features ... check it out ... it is well worth the time. We are in the process of running through our post OS install routine on an RTM version of SBS 2008. The SBS 2008 RTM does not have anything overtly different from RC1 that we can see so far. When working on the beta it was indicated to all of us that the RTM bits would be essentially an under-the-hood tweak of the RC1 bits. The install went fine, and our post install routine is going well too. Look for an SBS 2008 Setup Checklist to be posted here soon. It will not be totally comprehensive by any means, but it will have a good number of steps to follow through on right out of the box! The OS install portion may have decreased its install times exponentially, but it is looking like the post-install stuff is going to be quite time consuming. As much as Microsoft has gone a huge step forward for the Do-It-Yourselfer ... there is still a huge window of opportunity for us I.T. specialists to get in there and do our stuff! This OS is ripe for the tweaking ... in a way much more so than SBS 2003 ever was. SBS CodePlex for customized SBS 2008 report alerts. You Had Me At EHLO: Exchange 2007 PowerShell Scriptacular demo pack! Reputation: A solution based on our client's industry and redundancy requirements. Word of Mouth: Our reputation does indeed precede us. The occasional ad in the local phone books or newspapers. For us, the first two and the last are the big ones. Our clients have grown to know us as a resource for the I.T. solution needs. We are not a hardware or software vendor to them. We are an organization that can assess their given business circumstances with an understanding of how their particular industry impacts their I.T. needs. For us Canucks, the SMB market represents about 97% of all businesses. Yes, 97% of all registered businesses in Canada are SMB! Other countries probably have their economies driven in the same manner. Okay, so the Cloud will help to some degree with the under 3-5 seat crowd, but there are a lot of perceptions small business owners have about the Cloud and their data that need to be addressed first. So, that begs the question: Where is Microsoft's marketing strategy for this market segment? We have seen the ads for Windows with Mr. Gates and Seinfeld which I personally liked. Now, we are beginning to see the "I am PC" ads which may or may not turn people's cranks. The reality is actually quite simple to us here: Market the SBS product's abilities! For us, it wins the sale virtually every time when we demonstrate SBS' Remote Web Workplace among other SBS features. Most small business owners have never seen the Remote Web Workplace in action! In fact, many SMB focused I.T. "consultants" do not even know it exists! Getting a business owner's brain juices flowing will follow a 15 or 30 second spot that shows, repeatedly, a user accessing their various network resources via RWW. Each resource: RDP, SharePoint, Outlook Web Access, and others could be featured in a spot. That would provide an awesome foundation to build out from for further campaigns. One direction: Windows Mobile 6 integration ... and for us I.T. shops: who needs the headaches of installing the other fruit's Exchange integrated server! Something to keep in mind when it comes to small business owners: They, like us, wear many hats. ROI may be somewhere up there in the grey matter, but the nuts and bolts of their daily business needs tend to be right before their eyes. The linked site has a couple of really good CTS-V related videos. SBS 2008 has the ability to be marketed in the same manner ... the product has so many absolutely kewl features that just rock for the small business owner. Those features, the muscle and ingenuity of the SBS product, would absolutely kill in the marketplace ... if people knew about them! Secure remote access is one of the killer apps for both the SBS and EBS product line. Prior to EBS, how many of us in small consultancies, or SMB focused I.T. service companies, can remember the, "Holy *insert expletive here*" when demonstrating RWW to our Enterprise employed friends, industry peers, or other I.T. acquaintances? And finally: Where is the Microsoft Small Business Specialist logo in all of this? Why did we not see a link to finding one in the new SBS Console under the Community Links section? We get the logo if we click through to the Microsoft Small Business Center in the US. But, how many small business owners actually know what the logo means? An opportunity to tie in MSBS with SBS 2008 is ripe for the picking. Again, marketing MSBS to the masses to make sure they understand that those companies that hold the certification have demonstrated a dedication to SMB I.T. solutions, their clients, and the industry by getting certified. Folks, we are sitting on the CTS-V of server products in SBS/EBS ... and the engine is MSBS ... how about we market them as such? A bonus for having Software Assurance on all of our Windows Vista installations is the Microsoft Desktop Optimization Pack (MDOP). One of the kewlest tools in the MDOP pack is ERD Commander. It is a product that gives us low level access to the OS to bring about repairs or changes to get things working when things break. It was also quite expensive prior to Microsoft's acquiring of Winternals. There is a small caveat when working with the new version of the product: The OS architecture installed on the machine we are using to create the ERD utilities disk is the architecture that goes onto the disk. That is, when creating the rescue tools disk from a Windows Vista x86 based machine, the rescue disk created will be x86 based and only work on x86 OS based machines. If the rescue tools disk is created on a Windows Vista x64 based machine, then the rescue disk will also carry the x64 architecture and only work on x64 OS based machines. Check out ERD Commander ... it is an absolutely amazing product with some awesome tools. It has saved our client's bacon many a time! Just in case you were wondering: When logged into the Remote Web Workplace with a domain admin account after clicking on the Connect to Server Desktops link, your Server Core installations will be available for a remote desktop connection. While we do not log in to RWW using a domain administrator account often, we do need to every once in a while for specific reasons. It is good to know that once we have set the Remote Desktop Protocol to enabled on the Server Core installation and allowed the RDP protocol through the Windows Firewall that we will be good to connect and perform any needed tasks on our Server Core boxes via RWW and RDP. 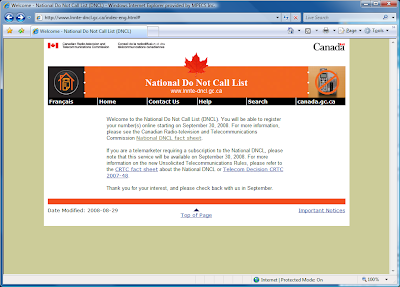 As of September 30, 2008, Canada will have an official National Do Not Call List (DNCL). Supposedly, anyone who adds themselves to the list should no longer be bothered by telemarketers. By supposedly, we mean that there are certainly a lot of exceptions to the rules! Essentially any telemarketers, charities, and others already in the telemarketing business are exempt from what we have seen. So, we need to be diligent in identifying the organizations calling us, writing times and numbers called down, and making sure they understand that we want to be removed from their call list. If we receive repeated calls, we can file a complaint and hopefully the Canadian enforcement organization follows through on their commitment to punish the offender(s). We can also use the iOptOut Web site to further grind the telemarketer's wheels to a halt ... though the list of companies contained therein is rather slim at this point. It is still worth the time to fill out the form there as it will be honoured by the DNCL. Telemarketer: Hi, we represent this most awesome cause and want to know if you would support us by buying ...."
Us: Hi, I am sorry but we have a company policy to never support any organization that phones us to solicit any form of support. There are no exceptions to this policy thank you very much. Also, remove us from your call list please (if we make it that far). For the most part it works. And, if everyone adopted the this policy both in their place of business and at home, we would see a lot of telemarketers going out of business and some relief from the time wasted answering their calls at our place of business and the supper time phone calls that we now ignore. The wikipedia entry for the National Do Not Call List. Static IP changed - Ack! :P Guess where the new one is listed?!? We just received yet another confirmation that having e-mail reputation protection services (RPS) such as ExchangeDefender is absolutely mandatory in all of our quotes and for our clients in general. The price of the reputation services is relatively cheap compared to the grief we just went through with one of our clients. Their ISP sent a note indicating that their true static IP was to be changing shortly. We made sure to prepare for the change, though there was not a lot to do before hand. When we received the new IP, made the necessary DNS A and MX record changes for their SBS box along with running the CEICW on the SBS box itself their e-mail essentially died within short order. This was expected. Any e-mail that was not making it to the SBS box during the transition was redirected to the ISP's e-mail servers and pulled down by the POP3 Connector. Once everything settled down and the Internet was aware of the MX changes they started getting NDRs from various sources indicating a problem via Spamhaus on virtually all e-mail they sent out. It turns out that the IP address assigned was not on a black list per se, but on their PBL advisory which is a list of supposed dynamic IPs that should not host SMTP services. Having an e-mail reputation service in place would have saved us from having all of this grief. With the SmartHost wizard in SBS 2008 setting up all outgoing e-mail to hit the reputation service provider's SMTP servers is a breeze. It would not matter whether the IP address was static or dynamic or whether the server was using some form of DynDNS service. All incoming and outgoing e-mail would be parsed by the RPS. The only consideration would be that the ISP would prevent any SMTP outbound e-mail that is not directed at their own e-mail servers. We have ISPs that are now doing this for their consumer level Internet products. They also block inbound 80, 443, 25, 110, 21, and other common ports for the consumer level. Keep in mind that in the case of ExchangeDefender, we as dealers make a small monthly residual on "providing" the service to our clients and also managing the service for them. With a large number of clients on the service, this makes for a tidy monthly sum to shore up that bottom line. Need to set yourself apart when it comes to quotes and proposals? Then Visio Professional is the way to go. Period. It gives you the ability to generate a current network infrastructure map quickly and efficiently, then to generate a proposed network map to give your prospect a visual aid to help them along. Microsoft is offering Microsoft Office Visio 2007 Professional Trial Evaluation Software for download. A Live ID along with registration is required. If you do not have the Microsoft Action Pack or TechNet Plus, then this is one way to have a look at the product and what it can do for you and your business. The core components of SBS 2008 can hold activation off for a combined total of 240 days. SQL Server 2008 can only run to 180 day trial period. 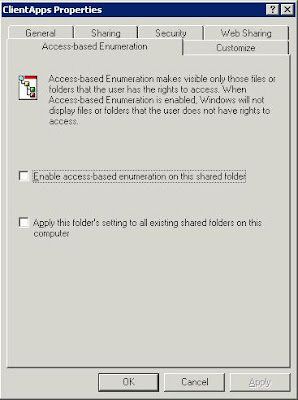 Microsoft KB 948472: How to extend the Windows Server 2008 evaluation period. The above KB article has a script that can be set to run automatically using the Task Scheduler. While automating the trial extension may be a good idea in some ways, it is also very dangerous. Make sure to put a reminder into Outlook indicating that the trial software is coming to the end of its life if the software is somewhere close to a production environment! Thanks to David Overton on the tip to extend the trial period: How long is the grace period on SBS 2008 (how long can you evaluate SBS 2008 without entering a product key). One thing to keep in mind: If a client project comes up where they are confirmed to go ahead with SBS 2008, we can install. We will leave the product in trial mode until such time as the client's product key arrives and we can activate with it. We do not need to miss an opportunity, or install SBS 2003 R2 as a bridge measure. We are so looking forward to going native with SBS 2008 and Server 2008 for our Active Directory, Exchange 2007, ForeFront and Live OneCare for Server, Remote Web Workplace and TSApps, the Group Policy Central Store (about half way down the article), and way powerful Group Policy settings! Oh ... and we are keeping our ISA :D ... we are in the process of securing SBS 2003 R2 Premium Open Value Licensing on a 3 year spread payment structure. Lots of goodies there folks! TechNet Plus now has the bits available for download and we are doing so as this is being written. Note that there is a scheduled outage for the TechNet site this coming Saturday. TechNet Scheduled Outage on Saturday Sept. 20 2008 from 08:00hrs to 18:00hrs. SBS 2008 RTM bits available to TechNet Plus subscribers for download ... soon. Note that the download link is not active. According to the TechNet chat we initiated, the bits are on their way and the link should go live shortly. Thanks to David Overton's tip that MSDN has the links too as that pointed us to check our TechNet Plus access. RAID 0 Recovery - RunTime RAID Reconstructor Works! We have a pair of 75GB WD Raptors on the bench. For prior recoveries, we have used RunTime's GetDataBack for NTFS. We have had amazing success with their product. The pair of Raptors were striped. That is, they were configured in a RAID 0 array for speed. Now, something has burped. All of the tables and RAID array configuration were toasted. So, we downloaded both the RAID Reconstructor and Captain Nemo by Runtime to test the drives for recovery. RAID Reconstructure discovered and setup the RAID array into a small image file that subsequently gets opened by Nemo. With Nemo, we were able to get full access to the data. The drives themselves were somewhat stable, though they seemed to hang up once in a while and require some assistance to restart the recovery process. In the recovery process, what is the first folder on the system that we will go for? For us, it is the Documents/My Documents folder because that is where data tends to be stored that is critical to the organization. If the client indicates that data is in an accounting program, we will go to that program's data folder first. The desktop would be further down the list. Though, we make sure in our initial interviews to ask where any critical data may be just in case. When it comes to disks that may not be too stable, we will go through the list one by one until the disk or disks no longer respond. We will toss them into the freezer for an overnight visit there, then try again in the morning. For the most part, we have been very successful, and thanks to Runtime, our odds of recovering data barring a physical failure of the disk or disks, are pretty darn good. Java Internal Error 2755. 1624, ...jre1.6.0_07-iftw.msi?!? It is getting very late, and I am setting up a client's data restructure for tomorrow morning ... part of the catch-up from missing a full day on Friday. Okay ... so where the chicken is the file? Everything grinds to a halt because of what? A file not in the proper place? We blogged about it before: Java install errors. There are many different folder/file synchronization utilities out there. For our data mirrors, we use Beyond Compare by Scooter Software. Why? Because the utility is absolutely awesome in its simplicity and ability to be scripted. It just works and has done so for as many years as we have been working with the product. It is also handy for comparing before and after changes to various files including their contents, before/after coding comparisons, and more. Microsoft recently released the newest version of their file sync product called SyncToy (link to download site). Now, we have not played with the newest version yet, but one of the winning features Beyond Compare has over SyncToy v1.x was the ability to sync Terabytes worth of data. Yes, you heard right: We said Terabytes. Ever try running a sync using SyncToy on a folder/file grouping of 100GB or more? By and large, it would run for an hour or two and subsequently choke. We would then be left with a plethora of the little tracking files SycnToy uses everywhere it touched. Cleanup after a choke was a chore. The above link is to the new SyncToy v2 download. Microsoft also has a forum for SyncToy to provide feedback, find usage tips, and bug reports. There are many other utilities out there too, but these two always seem to rise to the top of them due to their ease of use for the specific areas we apply them in. We just had our first "dry" run at Little Pea III's birthing. Our due date is not until Sept. 25. Nothing yet, but it does mean that I missed the SBS 08 beta exam. Going to spend the day supporting Monique. Exchange 2007 Update Rollup 4 for Exchange Server 2007 Service Pack 1 (KB952580) was mistakenly released to MS Update, the MS Update Catalog, and WSUS for download. The mistake was caught, but not before there was a possibility that the update was downloaded. For those running SBS 2008 in Beta or RC form, verify that your servers did not pull the update because it can terminally destabilize your installs. From the Exchange Team Blog You had me at EHLO: The case of disappearing Update Rollup 4. We just verified our RC installs and are fortunate that none of them show the update installed or pending. The out-of-the-box WSUS settings and manual updates for the server should protect us, but it does not hurt to verify that nothing went awry. Vista - A New Question for Troubleshooting - iTunes 8? It seems that Apple is surreptitiously delivering and installing software without a user's permission. One of the components of the recent iTunes 8 "update" is a known bad driver ... GEARAspiWDM.sys ... you draw your own conclusions on that one. BSODs are also indicating usbaapl64.sys as per the forum posts linked below. Now, when we are receiving complaints about erratic behaviours, especially lately, we need to ask if the user has iTunes 8 installed and recently updated. If iTunes 8 is installed, we need to remove the software and reinstall it, remove any unneeded software that was installed with the so-called update, then replace the bad drivers with known good ones or use System Restore to back things off. Ed Bott: An inside look at Apple’s sneaky iTunes 8 upgrade (original heads up). Ed Bott: Apple's sneaky iTunes 8 install pictorally. Apple Forums: Itunes 8 - Connecting Ipod cause Blue Screen on Vista. We do not have a high iTunes install base with our clients, but we will be paying particular attention to whether a user has it installed or not until Apple fixes things. That Start Button on the keyboard is pretty handy! Click the Start Button or hit the Start key on your keyboard. Oh, need to walk away from the system? One quick way to lock your workstation is to CTRL+ALT+DEL --> [Enter]. Hold the Start button on your keyboard and hit the L key. We had a strange Vista hiccup this afternoon with one of our clients: She was working in Word, opened a template to begin a project and the system literally hiccuped hiccupped her out. When she logged back in, her profile was initialized in temporary mode with no messages at all indicating that there was a problem. She knew there was a problem though because from there on in she was essentially answering all of the same initial questions one would get when logging onto the system for the first time. Her profile was in C:\Users\Temp. We tried to recover the profile by checking the settings in the registry, but they were correct. We tried to rename her original local profile folder, but when she logged in she still received the TEMP folder as her profile location. Log on as a local admin other than the user with the profile problem. Copy the old C:\Users\%UserName% contents to a network location. Find the SID for the user with the corrupted profile and delete it (profile directory will be C:\Users\%UserName%. Logon with the affected user's account. The profile will recreate itself and work just as it should. Copy the contents of the original profile back into their respective places. For Exchange integrated and My Documents redirected sites the contents will essentially be the user's Desktop and Favorites folders. Keep in mind that the Offline Files feature may take time to synchronize for large profiles and Outlook may take some time to build up the OST file. Fix tip: Vistax64.com Forums: Vista - User Profile was not loaded correctly (Samir ~2/3 way down). Microsoft KB947215: Error message when you log on to a Windows Vista-based computer by using a temporary profile: "The User Profile Service failed the logon. User profile cannot be loaded". Note that no message was displayed to the user. Please verify your SBS 2008 R2 pricing with your distribution contacts. We received a note this afternoon indicating that Open Value licensing costs for SBS 2K3 versions and CALs will be rising October 1, 2008. From what we can see, the SBS 2K3 R2 Premium first year payment on an Open Value Spread Payment Agreement will increase by approximately $450 after October 1, 2008. Your numbers will vary by locale. Once you have contacted your licensing contact at your favourite distributor to confirm, make sure to keep the pricing change in mind when quoting. Folks, this is another great reason to sell OVL before October first! I am participating in a LiveMeeting Webinar on SBS 2008 in about 5 minutes. I am personally very green to the LiveMeeting stuff as the last and only one I have facilitated in the past was for the Fresno User Group (Susan Bradley) and that one was a phone in setup. This one requires a headset, and we don't have any around! I had to run down to the local multi-drug-computer-grocery store to grab one. The Microsoft LifeChat LX-3000 USB headset looked to be what I like in a headset: Good sized ear muffs for comfort and a decent sized head band. Being a n00b at this stuff, it was a pleasant experience to plug in the disk to install the driver into Windows Vista, then plug in the headset and everything just worked! Well ... the Webinar is starting! You can register here! I will be a part of the upcoming Webinar presented by Untangle. Untangle will be presenting on Security in an SBS 2008 World tying in their Untangle firewall security product. For those looking for alternatives to ISA or SonicWall, Untangle may present one, though we have not had a chance to evaluate their product yet. We will be diving into the Untangle product along with others as we look for an alternative to SBS 2003 R2 Premium once SBS 2008 SKUs go live. Once we do, we will be sure to share the results here. Password: Give me that passphrase! If our clients do not use Outlook Anywhere (Outlook connected via RPC over HTTPS), then they may struggle a bit at first with the need to use the above format to logon to their desktop via the SBS 2008 Remote Web Workplace. That need will arise if the desktop OS they are running on the remote machine they are connecting with is Windows XP from what we have seen so far. The other username format: FirstLast@Domain. This situation is something to keep in mind when it comes time to train our client users after an SBS 2008 implementation. The new WD VelociRaptor sure are fast ... especially relative to their older sibling the Raptor. We just finished doing a bit of tweaking and upgrading to one of our client's personal system. Once we had the system together and the OS installed, the subsequent boot ups and reboots for driver updates were pretty stunning. Off the top, the two VelociRaptors come close to performing as well as the 4 Raptors configured in a RAID 0+1 setup! The new 300GB drives even come in a 3.5" hot swap backplane ready model too. So, we are looking to configure a set of four in a RAID 0+1 setup to see how much of an increase in performance there will be. We would bet that the performance increase is significant over the RAID 1 VelociRaptor setup, and substantial over the Raptor RAID 0+1 setup given our experience with them this afternoon. Western Digital is definitely one to watch in the spindle based performance category ... though with the advent of Solid-State Drives (previous blog post), WD has to hope that their significant investment in high performance spindle based drives pays off in the long run. For now, WD VelociRaptor definitely makes performance to value sense! Note the lack of laptop support. For us and our clients, we absolutely require Access-Based Enumeration (ABE) to be installed on every file sharing server and enabled on every network shared folder. It is mission critical because ABE hides any folders a user does not have permission to access no matter what method they use to access the file sharing server. Now, for some of our clients, and for ourselves, we are migrating our file servers to Windows Server 2008 Standard x64 Server Core installations. Performance improvements over Win2K3 Standard GUI install for older hardware with a hard drive refresh is impressive. Once the ABE install is complete, create your file shares, set permissions either via the command line on the Server Core box, another Win2K8 box, or via RSAT enabled Vista SP1. 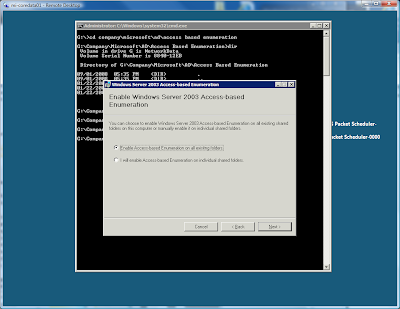 Note that SBS 2008 has ABE installed by default with permissions managed from within the SBS 2008 consoles! Hay Canucks - The MS TechNet Align IT Tour is coming! The Microsoft TechNet Align IT Tour is coming to various Canadian cities October 1 to November 13, 2008. The site: Microsoft TechNet Align IT Tour. As you may know, these events fill up fast, so, "make it so!" If the registration links do not work, then click on the page link above please. Trend Micro Worry Free Security is not so worry free? One of our clients, going on ten years in our business relationship, has been entirely virus free. To date, we were running Symantec's Enterprise A/V product through its various versions up to 10.2 which is just prior to their new EndPoint product. We may have our beefs with Symantec as a business and with its business practices, but at least the product worked. With our client's recent hardware and software refresh, we opted for Trend Micro's SMB product which is now Worry Free Business Security. We have all seen the plethora of ZIP files attached to emails about air flight plans and the like that have been filling our Spam or Junk folders. Well, one of the principles of said client absentmindedly clicked on one of those zip files because they just happened to have made their flight plans with the Subject's airline. Now, in the past, Symantec's A/V would have popped up a window stating that there was a virus embedded in the ZIP file, blocked access, and deleted or quarantined the file. For whatever reason, the Trend product did not do this. So, after essentially 10 years of being virus free, we now have a laptop that we needed to quarantine, pull off the network, and rebuild after pulling essential data off of it. We do not like Trojans - all infected systems get flattened. We checked, and double checked the Trend Management Console on the server and it clearly indicated that it was directing the clients to scan ZIP archives. In fact, we went through all of the settings in the console to make sure that things were as they should be for client settings and they were. On the infected client, we tested a number of different scenarios and the Trend A/V client never even considered there to be a problem. And yes, our server and clients were up to date with the current A/V definitions. This situation has left a very sour taste in our mouth. For now, we will be holding off any further Trend installs. BTW, this situation was the impetus for us to sign up with Vlad and OWN to begin looking at implementing Exchange Defender at our client sites. Having the ability to work with servers, workstations, and now laptops at a level where the machine's current power state is irrelevant can give us the edge when it comes to managing our client's networks. Intel's AMT, or Active Management Technology, gives us that edge. Using a simple tool like Intel's System Defense Utility, we are able to power cycle a system, redirect the boot source to a network based image, and more. All of Intel's Q series Executive desktop boards and any of the new Centrino vPro series laptops have AMT built in. Out of the box, we need to enable it in the system's BIOS, setup a new password (default out of the box: admin), and configure AMT for either an Enterprise environment where management servers will exist, or Small Business which essentially means it is stand alone. Add a product like Microsoft's System Center Essentials to the mix along with Intel's AMT management pack, and we have an excellent foundation for our Managed Services solution. While problems with the AMT setup are rare, they do happen. We had a new Acer 6592G series laptop hiccup after the AMT was initialized and we had finished setting up the client's apps. On a reboot, a red flash went by where the AMT messages should have been. It took a number of tries to get to the message: AMT Error was all it said. A call to Acer's support line, and subsequently into their top tier support people, and we needed to RMA the laptop. There was no simple way to reset the BIOS, TPM, and AMT.